@degroens Isn't a fan of sweet wines, but says If sweeter wine is your thing - don’t let this Lab Rat’s opinion move your cheese. This delicate White Zinfandel is full of red fruit, and balanced with a bit of sweetness to make this off dry wine clean and brisk in the finish. Enjoy this wine now on summer day picnics, with spicy Asian dishes or just sipping at your leisure. This Moscato has intense floral aromas coupled with an amazingly fresh, fruity, and smooth flavor profile, creating a mouth-watering finish. Fun to quaff with friends anytime for any reason. Let the party begin! Castoro is now a winemaking team effort. The team includes Niels, and his mentor Tom Myers. Together they discuss and decide how they want to handle each variety. “There’s a lot less romance in the every day wine world than appears from the outside,” Niels explains. “The winery isn’t a showplace, we don’t have big stone pillars and art collections, but we have everything we need to make great wine.” Establishing their own winery out in San Miguel and being able to produce their wines in one place as opposed to producing different wines in different locations, still ranks as one of Niels’ most gratifying experiences. @mehnyblooms @patmorita Such “wonderful” liquor laws we have, no? How much more are you saving by buying 2 full cases? Rather odd 2 case savings. I should get this, if only to give a white zin to @cortot 20 some odd years from now. That wine was made from Colombia’s finest Zinfandel beans, hand-picked by Juan Valdez! Interesting side note, no discussion boards available on any of the woot sites for the current daily offers. Temporary glitch? questions from a noob… these should be consumed young? where is *best place to learn which wines are typically expected to age, vs those that are made to be consumed young? Most wines are produced to be consumed young. Think I read somewhere that 95% of wines are made to be consumed within 2-3 years of release but some of those wines will cellar well for years longer. (I wouldn’t expect these to be among them, however). Wines that can be aged for many years, even decades, include serious reds that have (usually) seen substantial oak treatment and dessert/ice wines with high sugar levels, as the sugar acts as a preservative. Very few whites are good for aging long term although some Rieslings (especially German ones) and Chardonnays (especially French ones) have stood the test of time. @chipgreen @gstadter the embedded question “best place to learn which wines are typically expected to age” is a good one. I find CellarTracker.com doesn’t have a drinking window for many wines offered on Casemates, but that’s the best I know of. Some Casemates sellers will say in their description, but many don’t say. Even when CT does have a drinking window, it’s often unreliable. One trick I use to help determine the usefulness of a CT drinking window - click on “add my dates” and look near the bottom of the page where it will say something like this; “Best enjoyed between 2018 and 2024 (Based on 2 user opinions)”. Now you know how many CT users opinions were used to predict that drinking window - in this case, only 2 users. Not very reliable but if it was 20 users I would take some stock in it. I do not have a source for reliable aging advice but re: the 10+ year discussions, RPM is the “Resident Wine Expert” in the Casemates (and former wine.woot) community. He believes that high quality Cabernet Sauvignon wines should not be touched until they are at least 10 years old. Not everyone shares that opinion although one of the reasons for it is that Cab Sauv wines sometimes enter a “dumb phase” where they seem to lack flavor and fruit. This “dumb phase”, when it does occur, is usually in the 5-10 years from vintage time frame. So, the logical thing to do is either drink up while they’re young or hold 'em until they’re mature. I would be interested to learn more about the “dumb phase” phenomenon myself, like does it affect most wines at some point? To my knowledge, I have never heard of white wines going through it and the only other red where I’ve heard it discussed is Petite Sirah and it’s believed that the “dumb phase” for PS is somewhere between 10-20 years from vintage, at least that’s what former winemaker Peter Wellington has said, IIRC. But what about other reds - Merlots? Malbecs? Syrahs, etc.? And what percentage of Cabs and PS wines go through it? If you had 6 bottles of a nice Cab, say Chateau Montelena for instance, would there be some bottle variation or could you reasonably expect them to age in nearly identical fashion? So many questions… sorry to have unintentionally hijacked your aging concerns and turned them into a “dumb phase” discussion, although the topics are related, at least in some cases! I have to ask- why offer these at the end of summer? Would have been all over this two months ago. Now wondering why I would want to have so much sangria wine heading into September? @chipgreen @gtcharlie And don’t worry, they’ll be just fine next year when you really want them. How much RS is in each of the wines? How sweet are they? Can I be honest with you? This Casemates thing is pretty awesome. An email arrives from my new friend, Ariana. She’s sending wine, WOOHOO! Now the (Lab Rat) race is on. Like previous rats have noted, I need to get ahold of Fedex to have the package held. Just in time! WOOT! Mission Accomplished! Whew! Wonder what’s coming. Ariana didn’t say, so I scour the FedEx order confirmation screen for any details I might have missed. As my mind processes the purchase order, my full-on smile turns mediocre. 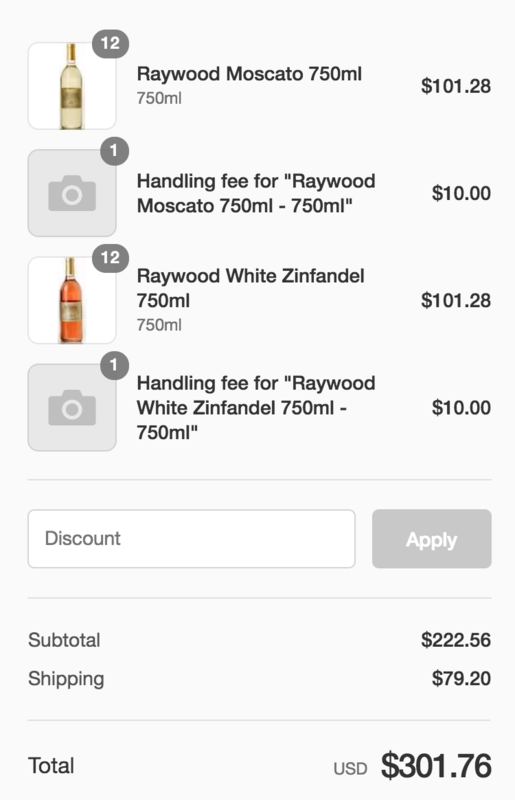 Purchase order number: RaywoodMoscato. Meh, I don’t really care for Moscato. Did I mention this Casemates thing is pretty awesome? On the way home from work Tuesday night, I pick the bottle up (thanks for holding the package Safeway!) and pop it into the fridge. It’s not until Thursday evening when I take the bottle out of the fridge and pull the cork. The honey aroma hits my nose. As I pour a bit into a clean Casemates glass, I notice that it’s slightly thicker than a chilled Pino Grigio and maybe a shade or two darker. It starts sweet on the tongue, finishes with some slight tartness and in a second or two - no residual. I pour a glass for my wife. Not her cup of tea. We both agree - it’s not as sweet as a Boone’s Farm or Manischewitz, but it’s seriously sweeter than the William Hill North Coast Chardonnay it was parked beside in the fridge. Bottom line: We drink a wide variety (reds, whites, sparkling, etc.) but generally avoid sweet wine. If sweeter wine is your thing - don’t let this Lab Rat’s opinion move your cheese. @degroens this Lab Rat’s opinion move your cheese. Got it, to funny!! @emtsees it is real wine. Just not the type you enjoy. Leave it at that. @emtsees Think of it as rosé of zinfandel, which it is. With a bit of RS. For as many types of wine that are out there, there are as many customers that will buy them. All our palates and tastes are different. Sutter Home made a fantastic red Zinfandel but it was their White Zinfandel that really set them on fire. Yes, it had some sweetness , but that is what customers wanted. Little has changed. Those of you who started out with White Zin., Boones Farm, etc. have moved up in your tastes which will continue to evolve. Once you are a true wine lover you will be able to evaluate any wine as to how good it is or not, no matter what your preference is. You may not feel as comfortable doing it but you can. Why do I say this? Well, I spent some 25+ yrs in the wine business and over 30 yrs. conducting tastings. I like to tell people that White Zin used to be the only wine I would drink and now it’s the only one I won’t drink. I certainly remember the quite nice (and very inexpensive) red (mostly Amador County) Zins that Sutter Home was known and respected for in the late '60s and early '70s before white Zinfandel happened. I say happened because the first time they made it sweet was the result of a stuck fermentation, or so the story went. They made a little white Zin before that, which was essentially dry and was actually quite good. Didn’t sell very well, just as Sebastiani’s very decent dry light rose of Pinot Noir (called Eye of the Swan) didn’t sell well. I think the first vintage I had was the '73 - when someone threw it in as a 13th ‘bakers dozen’ bottle when I bought a case of the '70 red Zin for a party. collegebob, if you’ve been in the trade a long time, you may remember how in the '50s the Wine Institute did quite a bit of consumer research trying to determine what people actually liked and would buy, as opposed to what they would say they would buy. One of the most notable (and acted upon) findings was that the average table wine drinker (as opposed to those who drank clearly sweet or fortified wines) actually preferred reds at about 1% residual sugar to much drier wines. Similarly with whites, up to about 1.5% residual sugar. Which is why most of the jug reds and jug whites, as well as much of the varietal white wine other than the tiny amounts of Chardonnay out there, were finished with 1% to 1.5% residual sugar. Sales were much improved! @chipgreen @rpm Yes, I remember the first SH White Zin. It was dry and only sold in 10th bottles at first. As they sweetened it the popularity rose greatly. Carey Gott at Montevina back in the 70’s produced a very dry WZ and I believe Wh. Cab. that were delicious. Yes, the Sebastiani Eye of the Swan was very pleasant drinking and as you noted didn’t sell as well. Others like, Simi’s Rose of Cab., Mirassou’s Petite Rose, and Pedroncelli’s Zin Rose were also on the dry at first and also very pleasant drinking. They were also very reasonably priced unlike many of today’s roses and more colorful “white” reds. For Chardonnay’s the Kendall-Jackson was probably the first really popular chardonnay with some RS. They didn’t tell anyone at first, though some of us could taste it, but it was well liked. Also true about the plummy and jammy wines with just under 1% RS. With .6 to .9% it is just above threshold…enough to take the edge off but not appear sweet. Heck, if it sells the wine and people think it is “dry” then no harm done. Yes, a lot has changed from the 60’s and 70’s to the present. Especially price differences vs quality. Thank goodness for Casemates. one bottle though I rarely use it. Once I open a wine it usually doesn’t take more than a day or two to finish it. Ugh, just mention Boones Farm and my head starts pounding!!! LOL Being young, stupid, and living without a care in the world during the 60’s and 70’s seemed to be fun times!!! Maybe just not the best years!! Finally some whites on here that I would love to drink and share with TC, and I can’t pull the trigger because 3 weeks ago I bought a couple cases of beer. Casemates, you have horrible timing. Or I do. Either way, no money on booze for the foreseeable future. @Humper I debated this one as well. But we need to drink through the current collection first. Anyone in the Baltimore area doing this? It’s still hot as hell in AZ and this wine is delicious with pizza and spicy chicken! Summer never ends! Anyone else concerned this hasn’t shipped yet? @InFrom nevermind… 43 minutes later and I get the shipped email!